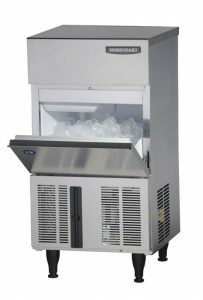 Ice Machines are one of the hardest working machines in your business. Even when you go home, they continue to run so that you have a full ice bin of cold hard ice for the next day of trading. So like any hard working piece of machinery, they need scheduled maintenance to keep them going and to save you an untimely (and more expensive) breakdown. So why do you need to do maintenance on an ice machine? Ice is a food! Yes that’s right. As ice is “consumed” it has to be treated just like any other food. Now, you wouldn’t serve water into glasses from a bucket of one year old water would you? 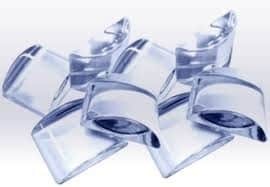 However, you would be surprised by the fact that the catering world often overlook that the ice sitting in the bottom of the storage bin could have been there for many months (or years). So as part of our maintenance we actually empty your ice storage bin and clean and sanitize it. We know we are sometimes beaten by competitors who charge less and skip this task, but they are only providing half of the service. Don’t risk the health of your customers. Contact us now to commence your maintenance plan. 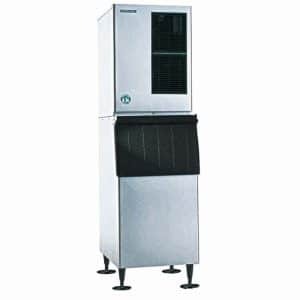 If you are lucky enough to own an ice machine that has simple instructions for cleaning, for example the Hoshizaki instructions that are on the inside panel, you could try it yourself. But a little like servicing your car, unless you are an expert you may be at risk of missing some important processes. The procedure involves emptying the machine. Certain water parts may be stripped and cleaned, then re-assembled. Be careful here. The plastic parts can sometimes break if you are unaccustomed to the disassembly methods and how hard you can handle the items. 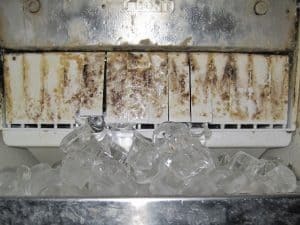 Once back together, the machine should be ran through a wash cycle using a quality de-scaler designed specifically for ice machines. 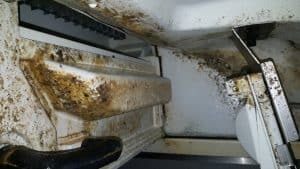 Don’t use the wrong product as high levels of Phosphoric acids can do more harm than good, attacking the coating placed on the evaporator and stainless-steel components. Depending on the brand, there may or may not be a “ice machine wash” switch. For the budget ice machine market, If there isn’t a wash switch, you will need a technician to do this job. But other areas like this photo below are hidden from the average person and require a bit more of a unit strip down. This process can take around an hour whilst we clean and let the de-scaler do its job. Finally, we finish of with sanitizer and rinse the water system through. The machine’s water filter is replaced and then we like to watch the first cycle of ice go through, throwing the first batch out to make sure only the best ice is ready for consumption. Occasionally ice machines breakdown and when they do you can bet it will be a Friday night! It doesn’t matter if your machine is a Hoshizaki, Manitowoc, Ice-o-matic, Brema, Scots ice, Scotsman or “whatever”, they all breakdown. But the good news is that we service all brands! 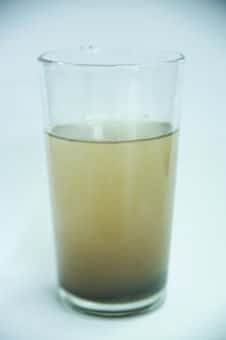 I always tell my tradesman that most issues with ice machines are “water related”, meaning that the problem will be normally a poor water supply through a simple blocked filter, or if no filter is present perhaps the solenoid strainer will be blocked. Other problems we have seen is a failed ice machine water pump, blocked irrigation circuits, ice machine float level sensors gummed up, and water leaks from hoses and drains. Most of these can be addressed with good old-fashioned maintenance. But if that opportunity was missed, all is not lost. 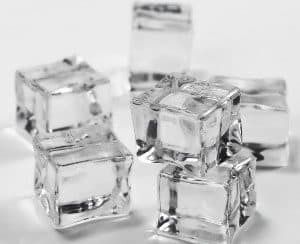 Other ice machine breakdowns can include parts like condenser fan motor failures, Compressors, Water Inlet valves, Hot gas valves, Pumps, Actuators, Curtains, Bin Switches, Bin stats, Timers and more. What we don’t have in our van, we can always source for you through our extensive list of parts suppliers. So, you need a new Ice machine? Before you start shopping let us help you understand your requirements and how to select the correct machine. What type of ice do you need? Whilst Flaked ice is typically used for presentation of seafoods and the like, if you are a Cricket Club and want ice for the esky, go for cubed ice as it lasts longer. Maybe you have a fast food outlet selling post mix? In this case we recommend crescent shaped ice cubes to maximize your profits. 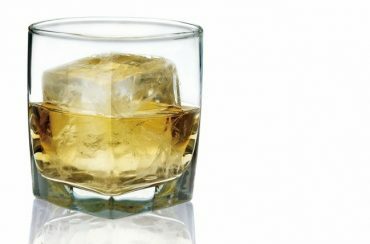 For the swanky bars serving drinks one the rocks, the trend is to use the largest cubes that Hoshizaki have available going right up to 48mm, and we can even do round balls of ice! busier times or should your business expand a little. Some units are known as “Self Contained” meaning they come complete with a storage bin. Others are supplied as “head only” and then you need to select a suitable “Ice Storage Bin”. When making your selection keep in mind that the machine might make 200kgs in 24 hrs, but if the bin for example is only capable of storing 100kgs of ice, you could in fact run out during peak times. Selection of the head, storage bin and even a self-contained unit needs a bit of thought. 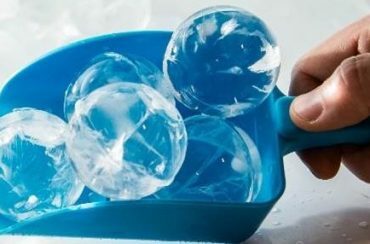 Don’t forget, that every time someone uses a scoop to get ice, they could be contaminating the “food” (ice). This is why ice dispensers are gaining popularity around hospitals and mine sites. If you are unsure, give us a call and we will help you through the selection process for your new ice machine.